Every year recently in the weeks prior to Anaheim 1 all the talk is about the upcoming season being the best ever. While there has been some good racing previously, 2015 is really going to live up to the hype. There is no doubt going to be a changing of the guard, but it's going to be in the form of several contenders. Immediately after the first round, Rockstar Energy Husqvarna Factory Racing has proven that the legendary brand has returned to a quest for glory and there is now certainly a big 6 in the manufacturer category. Technically this did not mark Jason Anderson's first 450 Supercross race as he raced at the end of last year in Sweden, as well as the MEC. However this was his first jab at the real deal, with all of his competitors eager for the first gate drop. Immediately in practice Jason was clearly one of the guys and fit right in. He looked at ease out there and that is in part because he is so comfortable on the bigger bikes. He qualified well and was set to head into the heat races with a good pick at the gate. With the format change to include semis made last year, only 4 riders can transfer out of each heat. That's a tough feat in itself with the caliber of athletes trying to nab those spots. In similar fashion to Anderson's noteworthy pass on Cole Seely a year ago, in almost the same exact spot on the stadium floor, Jason aggressively moved passed Justin Barcia for the final qualifying position in the second to last corner. Showing that he is not scared to run with the big boys, including the one known as the most intrusive in the field. JA almost collected the holeshot award in the main event but went a touch wide and lost a couple positions. He quickly moved into 2nd place however; right behind training partner Ken Roczen. Initially a gap formed between the two until Jason settled into his pace and at times even making up a little bit of ground on the leader. He showed maturity throughout the entire main event, never wavering en route to an extremely commendable 2nd place finish. Mr. Anderson is no doubt a force to be reckoned with all year. Jason Anderson: "Race was good tonight, got a good start, settled into a pace and ended up with a podium so I'm stoked! I expected to hopefully have a good night and be in the battle, but what happened was crazy. I train with Kenny [Roczen] during the week but we didn't know where we were at with each other as far as racing. Going 1 and 2 we talk about it, but it actually happening is surreal." Zach Osborne has championship aspirations for 2015 and rightly so. While the field is also stacked in the 250 class, he is clearly one of the favorites and that was evident all day in qualifying, where he ended up securing the 3rd fastest time. In his heat race, a war broke out between several riders swapping positions immediately, vying for the lead. Things got a bit aggressive between Zach and Tyler Bowers and the result was not in Osborne's favor. Bowers came into him hard in the turn after the finish line sending Zach sprawling into the next lane. He was unable to recover and return to a qualifying position by the time the checkers waived and after further prognosis there was some bad news. Zach had sustained a fractured thumb. After a lot of tape, he decided to head down for the LCQ and just see how things would feel. Fighting through the pain, he won and went back to the team semi to recoup. Then his true heart really shined through in the maine event. He managed a good start and you could just tell he was riding inspired. In the end, he too picked up a podium in 2nd place. Coming off the track and going down to one knee, his glove needed to be promptly cut off to relieve pressure. He repaid Bowers on the podium with a champagne blast to the face and they talked it out. Osborne's championship hopes remain intact. Zach Bell has been under the radar a bit after a quiet 2014 season. However; he will be opening some eyes very soon. Bell was fast all day in qualifying and even faster when the gate dropped for his heat race. Starting outside the top ten he came out of nowhere. Dicing through the pack picking off rider after rider, incredibly he was suddenly into 3rd place where he finished. This drummed up some excitement for the main. Unfortunately he went down in the difficult sand section early in the race and was mired deep in the pack. It is apparent that Zach will be making his own run at podiums in the very near future. Zach Bell: "The night didn't quite go as I planned. I felt fast all day in practice and I was excited for the night. I came through the pack and rode really well in my heat race. Then in the main I got a decent start but then went down in the sand. All in all I have something to build on and I'm heading into the second round healthy." 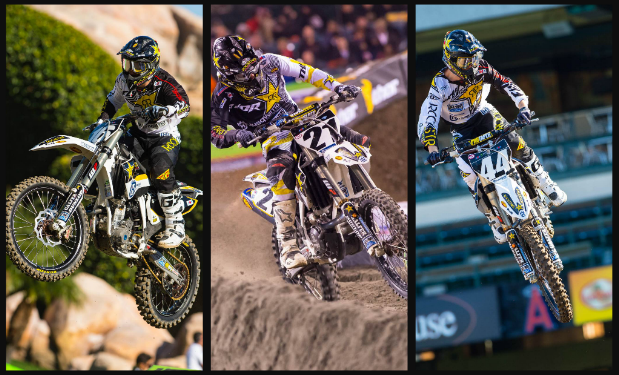 The Rockstar Energy Husqvarna Factory Racing Squad will now make the short jaunt to Phoenix for round 2. Anderson will look to repeat his success and prove to any critics that he's in this title hunt for the long haul. Osborne will take it easy during the week in an effort to let his injured thumb heal as much as possible. Bell will keep doing what he has been doing and aim for a much better finish in Arizona.